Suddenly, SJVC Temecula’s Connect Crew is the campus club everyone wants to join. Membership has shot to more than 24 since its recent student recruitment launch. Kevin Caldwell, High School Admissions Representative, and new Connect Crew Advisor, went to every classroom and talked to students about why they should get involved and how they could help. “It is important for them to get involved on campus – and their membership also looks good on resumes they send to employers,” he says. Connect Crew members have several areas of responsibility. They are important SJVC ambassadors who work with high school seniors as they consider continuing their education on the Temecula campus. Crew members help host Open Houses, College Fairs and Career Days, where they set up information booths and interact with potential students and their families. They also lend some student guidance at campus orientations. “We get to have the opportunity to communicate with outside students about how great SJVC is and the programs offered,” says Brianna Marron, Connect Crew member, who especially enjoys connecting with students about becoming a Medical Assistant – her program choice and career ambition. There is also a strong community service component to Crew membership. Members recently took on their first project. 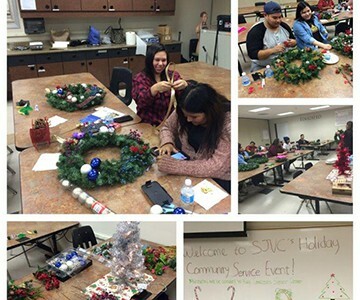 A group of 16 high school seniors and Connect Crew members worked together to make six beautiful Christmas wreaths for the local Senior Center. The team had great fun demonstrating their creativity and helping the Center provide a little more holiday spirit for their residents. Even though Connect Crew members spend a lot of time helping others, they, too enjoy many benefits of their volunteerism. Anyone interested in joining the Connect Crew on the Temecula campus should contact Kevin Caldwell at Kevin.Caldwell@sjvc.edu.